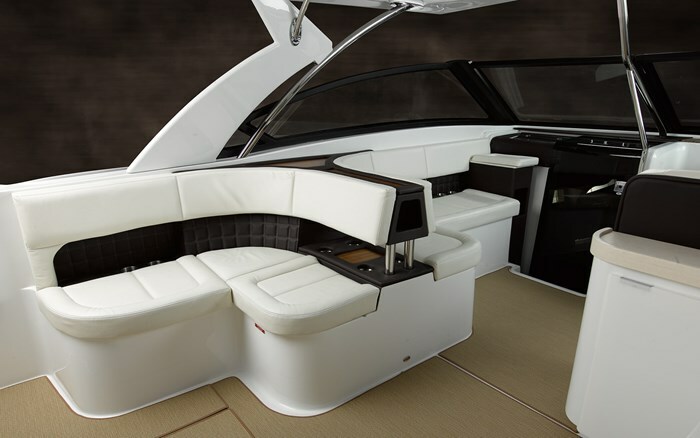 Cobalt describes its new A40 as, “The ultimate day-boat,” but this perhaps doesn’t do justice to not only the largest boat in Cobalt’s 2015 line-up at 39 feet, six inches length overall on a wide twelve foot beam, but also to the fact that the A40 is Cobalt’s only mid-cabin express cruiser with full live-aboard accommodations. For 2015, Cobalt Boats of Neodesha, Kansas, offers a total of twenty-five models from nineteen feet to this A40’s forty feet in six series of bowrider runabouts, watersports boats, deck-style boats and including three cuddy cabin models. The A40, subject of this review, is its only sport yacht. As Cobalt’s largest boat, it exemplifies this boat builder’s passion for excellence in construction, materials, and in its complement of standard equipment. One step up from the swim platform which is perimeter protected by Cobalt’s signature surrounding stainless steel band and with a centre-mounted under-slung boarding ladder, are both port and starboard companionways leading to the A40’s one-level cockpit. 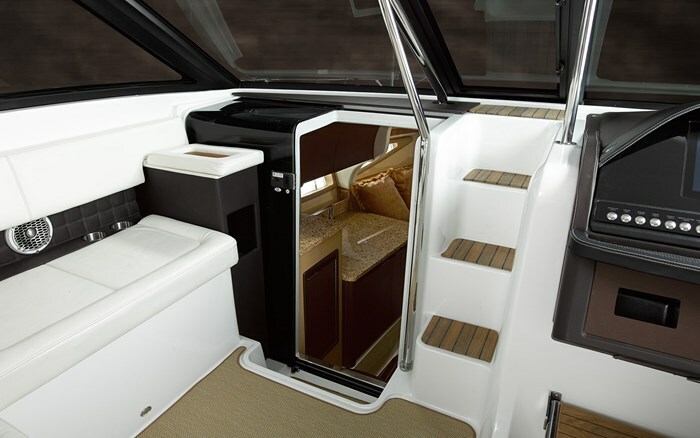 Most prominent when entering the cockpit from either side is the huge four-person convertible transom island sunpad complete with a three-position backrest. And this backrest itself is divided to allow each half by themselves to accommodate two persons for aft-facing lounging or when folded flat, for sunbathing, and in addition, for forward-facing seating within the cockpit. The entire port side of the cockpit from the cabin bulkhead aft is comprised of two L-shaped lounges, one forward for companion seating/lounging opposite the helm, and one ahead of the aforementioned transom sunpad which itself converts to a forward-facing four-person bench seat. Opposite this aft portside L-shaped lounge is a starboard side standard L-shaped cockpit refreshment centre complete with sink, refrigerator, trash container, and storage positioned immediately aft of the double or even three-wide driver’s helm bench seat. 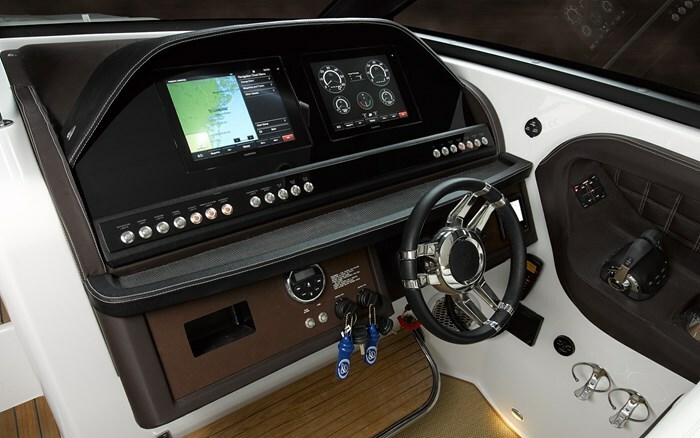 At first glance, the driver’s helm itself appears uncluttered and perhaps plain but upon inspection it is the latest in marine technology, the highly advanced “Glass Cockpit” with not one but with two Garmin 12-inch 8212 colour touchscreens front and centre with no traditional circular gauges to be seen. Everything you need to know is available and accessible on these two screens from “analog looking” engine instrumentation, trip logs, fuel data, to a digital compass, water and air temperature, depth sounder, even tide tables, plus of course full GPS chartplotter navigation, etc. Centred within the cabin bulkhead is a molded-in four-step staircase with step pads and stainless steel handrail leading up and through the centre-opening windshield section to the expansive and relatively flat and easily manoeuvrable foredeck complete with its standard twin single-wide sunpads with integrated adjustable lounging backrests and positioned on each side of a centre foredeck walkway. Very low profile bow rails which end on each side short of the bow add a very European flavour to the A40’s profile. The standard anchor windlass with all-chain rode is housed within the anchor locker with the anchor roller protruding from the bow stem leaving the foredeck surface unobstructed. 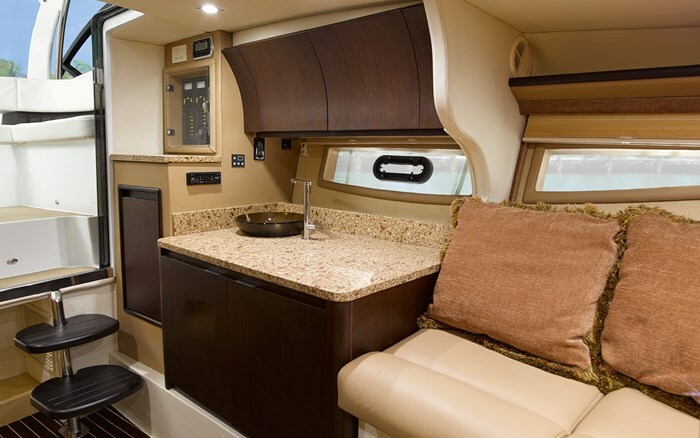 A sliding smoked acrylic door leads three floating steps down to the naturally bright, sumptuous cabin below with its almost full-length hullside windows with opening portlights within, granite-topped galley, Austrian free range leather seating surfaces, suspended headliner, Espresso matte finish cabinetry, and Sisal floor covering. The galley is standard equipped with a mid-level refrigerator, glass basin sink, and cabinet-mounted microwave. 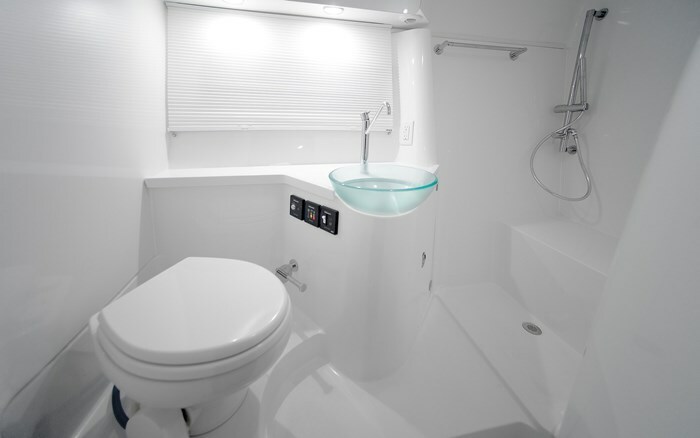 The starboard side head compartment features another glass basin sink, VacuFlush toilet and separate enclosed shower stall. 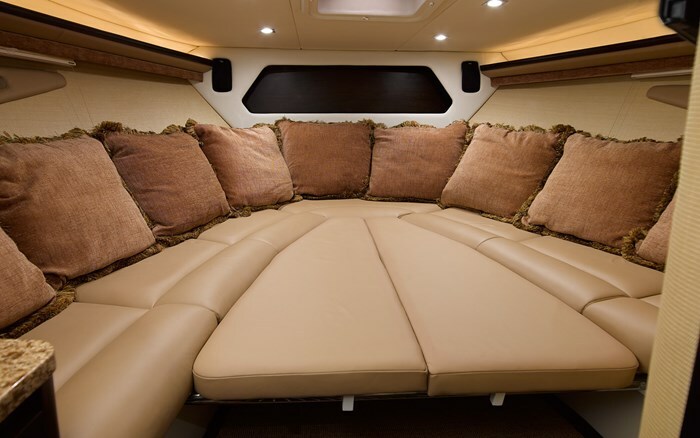 Forward is a convertible V-berth/dinette and aft, a mid-berth with full-length facing couches with filler cushions for conversion to a full size bed. Air conditioning is standard. 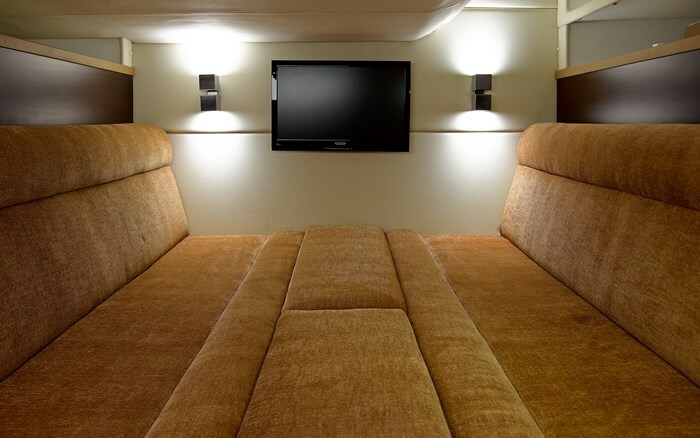 Entertainment is provided by a premium sound systems with transom and dash remotes plus iPod, USB, and MP3 connectivity. Other notable standard equipment includes a hardtop with dual speakers, LED lighting, and windscreen connector, remote helm battery switches, electric engine hatch, snap-in cockpit carpet, 60-Amp battery charger, automatic fire extinguishing system, trim tabs with Autoglide system, diesel or gas generator, and of course a Kevlar-reinforced hull with all fibreglass and composite construction. 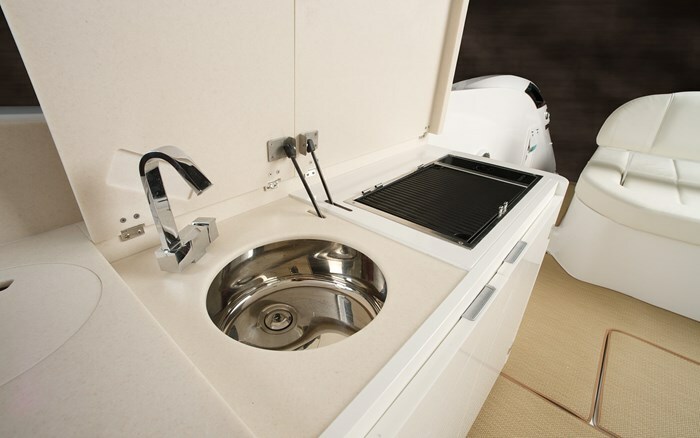 Notable optional equipment includes full canvas enclosure, Garmin radar, mid-cabin and cockpit TV’s, central vac, cockpit grill, ice maker, and dinette table, remote spotlight, docking and underwater lighting, transom shower, and Cobalt’s unique hydraulic swim platform. 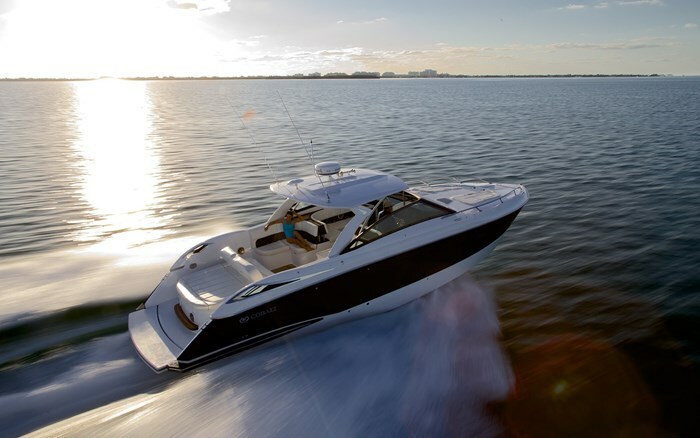 Standard sterndrive power is supplied by twin 430 horsepower MerCruiser 8.2 Mag HO ECT with Bravo3X outdrives and Digital Throttle and Shift (DTS). Optional gasoline or diesel sterndrives from Volvo and MerCruiser with or without Joystick or Axius control respectively from twin 330 horsepower (diesel) to twin 430 horsepower (gasoline) are available.